What statistics are useful to research for ice hockey betting? The first step of learning how to bet on ice hockey is understanding how the sport works. Like soccer, basketball and other team sports, the ultimate objective of the game is to outscore the opposing team. 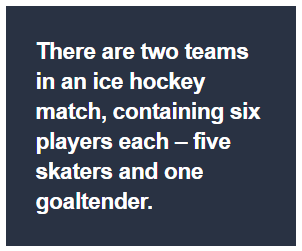 There are two teams in an ice hockey match, containing six players each – five skaters and one goaltender. The typical roster size of an ice hockey squad is 20 players. The high number within a roster is due to the physical nature of the game, despite being a sport needing just six players. Ice hockey involves plenty of high-contact scenarios and, subsequently, each team is allowed an unlimited amount of substitutions during a match. In addition to the goaltender, an ice hockey team will be made up of two defencemen and three forwards. There is both a left defenceman and right defenceman. The three forward positions are left wing, centre and right wing. Ice hockey betting: How is the game settled? Ice hockey matches in regulation time (matches that do not go into overtime after ending in a tie) are divided into three 20-minute periods. 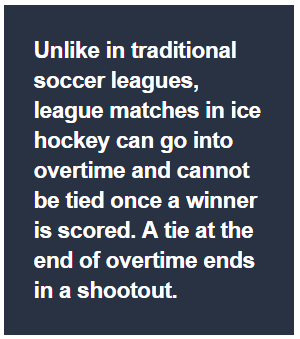 Unlike in traditional soccer leagues, league matches in ice hockey can go into overtime and cannot be tied once a winner in overtime is scored. A tie at the end of overtime ends in a shootout. A shootout involves a team’s skater facing the opposing goaltender in a one-on-one. If they score, they earn a point, with each team getting three shooters. The team with the most goals after three penalties each will win the game – or the shootout will go to sudden death (the first team to score and then see their opponent miss wins). Just like in baseball betting or NFL betting, the Money Line in ice hockey refers to betting on who will win the match. Handicap betting is offered when one ice hockey team is heavily favoured against another. To even things out, the bookmaker will offer a handicap on the number of goals in the winning margin. For example, if one team has a handicap of -1, a bet on them will only be successful if they win by more than one goal. Betting on the opposing team at +1 will win you the bet if that team wins or if the match ends in a draw. 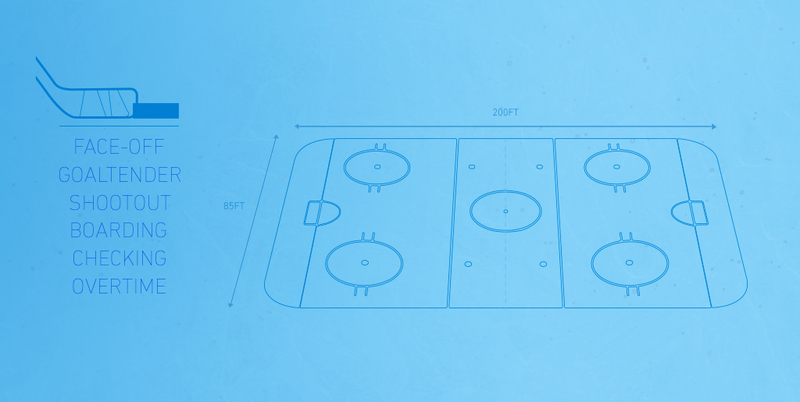 Similarly to other team sports such as soccer and handball, ice hockey is decided by goals. As such, one can bet on whether the total amount of goals in a match will be above or below a specific figure pitched by the bookmaker e.g. 4.5. Due to the possibility of overtime in ice hockey, Pinnacle also offer a Totals market including overtime. In this instance, a bettor would receive less-favourable odds for the same over 4.5 bet but would still win both in regulation time and if there was overtime. An important part of learning how to bet on ice hockey is knowing which competitions are available and when those competitions take place. 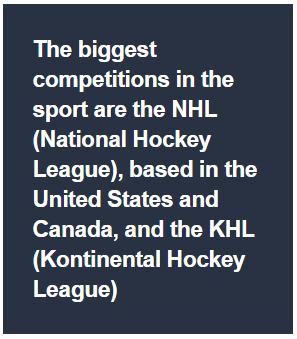 The biggest competitions in the sport are the NHL (National Hockey League), based in the United States and Canada, and the KHL (Kontinental Hockey League), based in Belarus, China, Finland, Kazakhstan, Latvia, Russia and Slovakia. There is also international ice hockey, with the IIHF World Championships held annually and Winter Olympics every four years. The NHL starts in October, running through until June of the following year. The best teams in the regular season qualify for the Stanley Cup playoffs, where an overall winner is determined in a knockout format. The KHL follows a similar structure. For the 2017/18 season, the KHL began at the end of August and will end its first stage at the beginning of March. The playoffs then take place from March until April. Other prominent leagues include the SHL (Swedish Hockey League) and AHL (American Hockey League). Ice hockey betting is most popular in countries where the sport has flourished, such as Canada and nations in Northern and Eastern Europe. Statistical research is a good place to start when trying to get an edge over the bookmaker, while using a staking method will help bettors optimise any edge they have. As with many sports, one factor that needs to be considered when learning how to bet on ice hockey is home advantage. Certain teams will be stronger at home and strengths can be accentuated in a sport like ice hockey, as teams travel long distances to play and the fans are notorious for having an impact when it comes to creating atmosphere. In terms of individual positions, it is worth studying the quality of a team’s goaltender. Although ice hockey is a team sport, the goaltender is a position of huge importance. Tactically, meanwhile, those interested in live ice hockey betting may want to examine a coach’s ‘line changes,’ when defensive pairings or the offensive trio are changed in response to opposition tactics. Finally, those looking to find value in totals markets may choose to utilise goals-per-game statistics. Upon conducting research, bettors may find that goals-per-game stats in the NHL are relatively consistent. This provides opportunities to capitalise on an outlying team that is particularly high or low scoring.